Bogota, Feb 8 (EFE).- Palm oil and the potential of its phytonutrients constitute a business opportunity for Latin American countries, especially Colombia, which is preparing itself for a post-conflict scenario, specialists participating in a conference here on the sector’s prospects agreed on Monday. 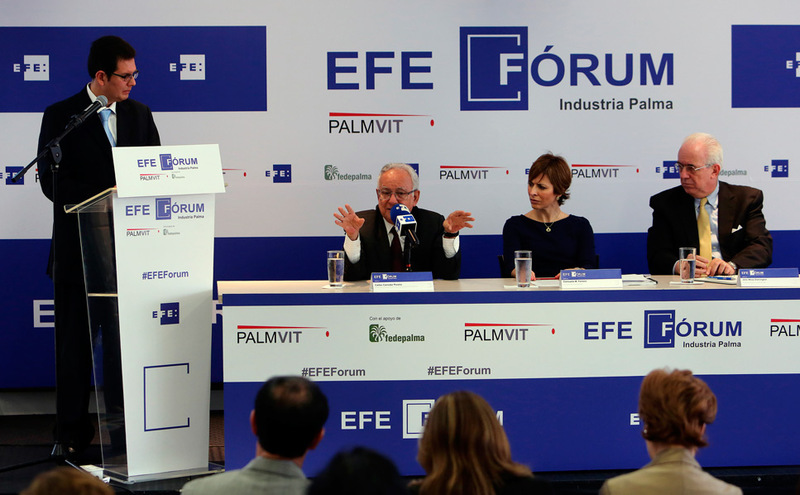 Within the framework of the 1st EFE Palm Industry Forum in Bogota, scientists and businessmen emphasized the opportunities afforded by this product in areas such as nutrition, cosmetics and the pharmaceutical industry, among others. The president of the National Federation of Oil Palm Growers of Colombia, or Fedepalma, Jens Mesa Dishington, said that the sector’s agroindustrial development potential is “immense” now that Colombia “is in the negotiation phase to terminate a conflict” with the FARC guerrilla group. Mesa said that in Colombia, the world’s fourth-largest palm oil producer and the largest in the Americas, there are already some 500,000 hectares (1.25 million acres) of cropland producing some 1.3 million tons of palm oil in more than 120 municipalities. “The Colombian government has often said the palm crop is capable of substituting, for example, the coca crop (the raw material of cocaine) because it really permits more stable growing conditions and provides real opportunities for young farmers to find a better future,” he said. For Spain’s ambassador to Colombia, Ramon Gandarias Alonso de Celis, the palm oil sector is one in which the country “has much knowledge” and where the potential for “enormous development” exists. Regarding the crop’s potential, Consuelo Ferrero, CEO of Spanish chemical engineering company Palmvit, said that palm oil is “another liquid gold,” given the quantity of phytonutrients it contains and its market value. Ferrero added that palm oil’s high commercial value is due to the fact that it is a natural product containing a great amount of tocotrienols, an exclusive form of vitamin E with great anti-oxidant and cardiovascular protection properties. “The numbers speak for themselves. While 100 liters of palm oil would generate about $92 in business, the same quantity of tocotrienol sold to the cosmetics industry, for example, would generate about $7,500,” she said. Meanwhile, Colombia’s deputy minister for Entrepreneurial Development, Daniel Arango, called on the sector to “increase its productivity,” warning that it has grown in extent but its productivity has not expanded at the same rhythm. “We must focus ourselves on products with greater value added,” he said. Agriculture Ministry permanent crops program coordinator William Granados Perez said Colombia expects to add 150,000 hectares (about 370,000 acres) to its palm oil plantations over the next three years.